Ted Breidenthal has taken a leading management role with SAMI’s full-service clients since 2001. He is the director of the Citizenship Through Sports Alliance, a sportsmanship-focused advocacy group that includes many of the nation’s most prominent professional and amateur sports leagues/associations. He is the commissioner of the Association of Division III Independents, a group of 15 NCAA Division III member schools that are not part of an NCAA conference. In 2008, he was named commissioner of the NAIA’s Association of Independent Institutions (A.I.I. ), where he leads a 36-school conference of independent schools from the U.S. and Canada. He also is a consultant with the 1A Faculty Athletics Representatives, an association of 119 faculty representatives from the NCAA’s Division I Football Bowl Subdivision schools. In the spring of 2009, he completed a successful sale of the Amateur Baseball Umpires’ Association, the largest membership association for amateur umpires in the U.S. He led the organization as executive director from 2000 until its sale to the Jim Evans Umpire Academy. 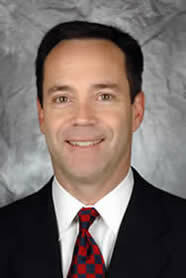 Breidenthal spent nearly 12 years on staff at the NCAA, where he was a key contributor in the playing rules administration area for major sports (baseball, football, ice hockey); the publishing of records and rules books; and the development and implementation of officiating improvement programs in college baseball, ice hockey and football. A member of the American Society of Association Executives (ASAE), and the Kansas City Society of Association Executives, Breidenthal has a bachelor of science degree in journalism from the University of Kansas.